I love historical novels, and am especially fond of those that revive a way of life long gone. 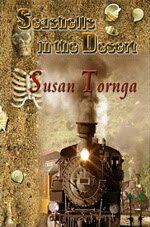 Susan Tonga, with Seashells in the Desert, does just that with Tessa Crane, a Harvey Girl. Having just watched “The Harvey Girls” movie again, I find Susan’s yarn of life as a Harvey Girl to be much more in keeping with “the way it was” than the musical extravaganza pitting Angela Landsbury (wicked saloon girl) against Judy Garland (virtuous Harvey Girl). Not only is this a Historical Western, it is also a mystery, so who could ask for more? Tessa Crane is a waitress in the Winslow, Arizona, Harvey House restaurant, one of a chain set up by the innovative Fred Harvey to serve fine dining to passengers of the fledgling Santa Fe Railway. She gets embroiled in a murder when an elegant female passenger is found dead in an alleyway, and her roommate’s brother is suspected. I enjoyed reading this book, finding only one flaw that I would call a touch of revisionist history. Ms. Tonga has Tess rooming with Lupe, a local Hispanic girl. Right or wrong, in the world of Fred Harvey, only “well-mannered, educated, white women, 18 to 30 years of age, of good character,” need apply. While Susan does make note that Lupe is only allowed to work in the kitchen and not as a waitress, I seriously doubt Mr. Harvey would have allowed the mixing of races in the strictly run dorms. I also wonder that two girls escaped the legendery eagle eyes of the dorm mothers in order to run loose all night, but then, girls will be girls. Historical PC aside, this a book worth reading.